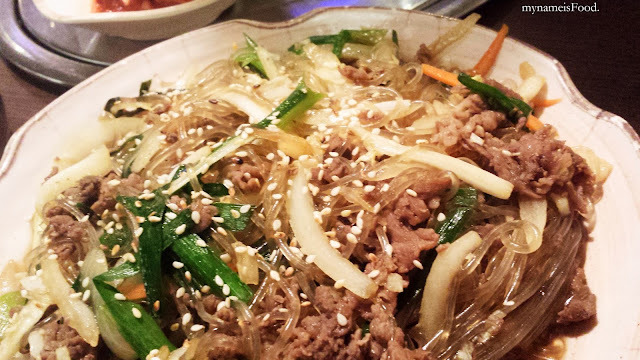 Midam Korean Charcoal BBQ, Sunnybank Hills, Brisbane - my name is Food. The last time we ate here was for their Korean BBQ Buffet so when we decided to come for a-la-carte during dinner on a weekday, we didn't know what to expect. The restaurant was somewhat busy but only on one side of it which was the Korean BBQ area whilst the normal tables and seats weren't as full. 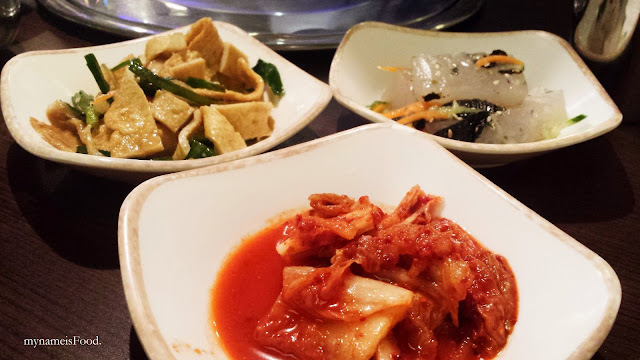 The only problem I've had with Midam is that their side dishes options aren't as much as the other korean restaurants you go to. You only kind of just get the basics..
From Left to Right: Fishcake lightly marinated in a bit of soy sauce/sesame oil with spring onions, Kimchi, Water cake with shredded carrots and seaweed and sesame oil. 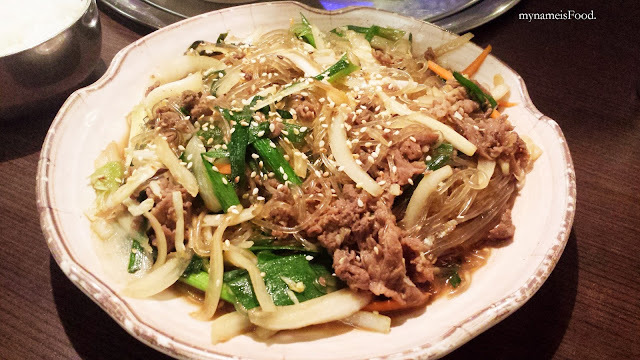 As it was quite a chilly night and we had desserts at home that I made the other night, we ordered 'Jap-Chae' which is glass noodles with onions, spring onions, carrots and bulgogi beef in a light soy sauce and sesame oil based. It is quite a light dish but when you start eating it and a light dish can somehow turn into a filling dish. Plus, usually people would order this dish as an entree to share or for your own, not usually a main. But, ah well.. we enjoy it as a main, it tends to be heavy for me as an entree. I found that the marinate seemed to be a bit more oily and lacked the strength of the sesame oil and the soy sauce. However, the beef was cooked well along with the simple vegetables. If you are hungry, and don't want your Kimchi pancake or Seafood pancake or dumplings or salads for an entree, do order this because I'm sure you'll enjoy it. 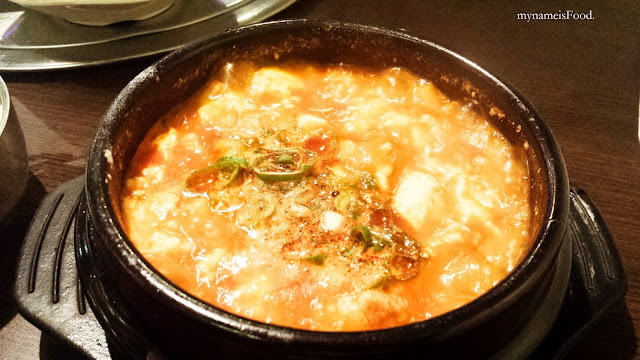 'Kimchi Jji-Gae', Kimchi stew with pork. 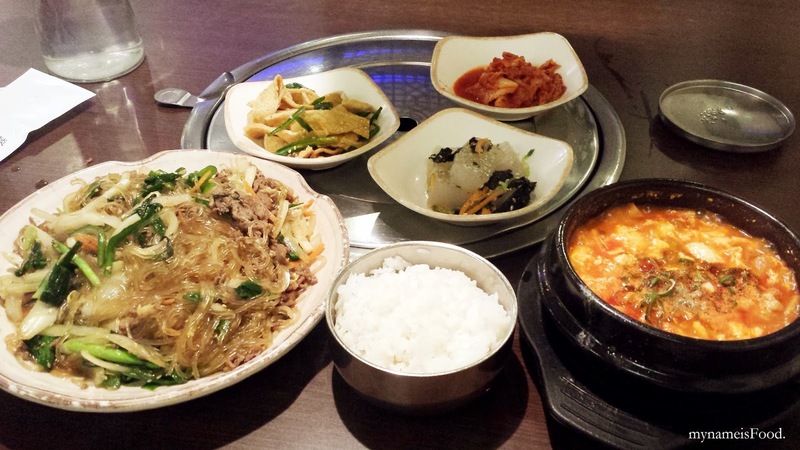 Definitely a must try if you want a classic Korean stew soup dish. It has the strong flavours of kimchi, along with bits of kimchi inside, also the thin pork belly gives it that extra flavour, allowing the kimchi and tofu not to be a vegetarian dish or such, but has meat in it making it delightful. Comes with a bowl of rice, but do eat it quickly while it's warm or if you're not really into spicy that much, a little hint is maybe add a bit of water into it and mix it.